New Delhi: Sri Lankan president J.R. Jayewardene asked Indian prime minister Rajiv Gandhi in 1986 to hand over Tamil Tigers chief Velupillai Prabhakaran to him so that he could hang him in Jaffna. Jayewardene made the request to Gandhi during the SAARC summit in Bangalore, reveals former Congress leader K. Natwar Singh in his autobiography, ‘One Life is Not Enough’ (Rupa). Natwar Singh was then a member of the Gandhi government. New Delhi had asked Prabhakaran to come to Bangalore so as to meet Jayewardene in a bid to end the Sri Lankan ethnic conflict. ‘We had kept Prabhakaran’s presence in Bangalore a secret but somehow President Jayewardene got to know. ‘Rajiv, hand him over to me. I shall hang him in Jaffna, where he shot dead the Mayor who was a Tamilian,’ he said. The reference was to the 1975 assassination of then Jaffna Mayor Alfred Duriappah by a group of young Tamil militants, including Prabhakaran. This was the first known murder committed by Prabhakaran, who founded the Liberation Tigers of Tamil Eelam (LTTE) in 1976. Prabhakaran was finally killed by the Sri Lankan military in 2009. Natwar Singh, who played a key role in framing the 1987 India-Sri Lanka agreement, says that ‘talking to Prabhakaran was an exhausting experience. ‘I told him that there could come a time when he would have to face the combined might of the Indian and the Sri Lankan armies. ‘Frankly, at that time, I underestimated the depth of his fanatical determination,’ Natwar Singh says in his 410-page book. According to Natwar Singh, Rajiv Gandhi was ‘for some reason … in a great hurry to find a solution for the ethnic problems in Sri Lanka. 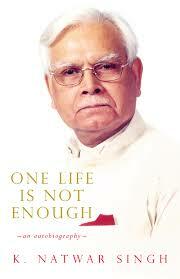 ‘Perhaps it was his successful handling of the Punjab and Assam crises which had given him confidence. ‘However, Rajiv Gandhi was not familiar with the history of the ethnic problems in Sri Lanka. ‘It is my firm belief that presidents and prime ministers should not get involved in the nitty-gritties of negotiations,’ says Natwar Singh, a long-time Congress leader who quit the party later after being named in a corruption scandal. Natwar Singh says that then external affairs minister P.V. Narasimha Rao had reservations about the 1987 India-Sri Lanka agreement that sought to end the Tamil separatist campaign. But Rao ‘was unwilling to take them up with the prime minister,’ he says, without revealing Rao’s reservations. But he admits ‘there was merit in Rao’s doubts’ about the success of the 1987 pact. The author feels that Rajiv Gandhi, as the prime minister, should not have met Prabhakaran in New Delhi just before flying to Colombo to sign the India-Sri Lanka agreement. Four years after the 1987 accord, a Tamil Tiger suicide bomber blew up Gandhi at an election rally near Chennai in May 1991. A year later, India outlawed the LTTE.